Fall is upon us and it’s time to get ready for the harsh elements of winter. With energy bills going up during the winter season, here are some helpful to save money on your energy bill. Since its fall, the weather tends to be in the mild temperatures. Now is a great time to be proactive and do a thorough checkup on your home to see if there’s any maintenance that needs to be done to weatherize your home. Make sure your windows and doors have no leaks in the weather stripping where air can leak through. You want to make sure any leaks you find are repaired or covered before you start heating your home. Any drafty windows you do have, cover them with a clear plastic sheet around the frame. The plastic has to be sealed tightly to the frame to help reduce infiltration. If you have a fireplace, keep the damper closed unless a fire is burning. Keeping the damper open is like have a window open during winter; it allows warm air to go straight up the chimney without you even knowing. Spring and fall are the best times of the year to schedule an inspection on your HVAC systems. Keeping your systems clean, calibration, and maintenance up to date will help cut down on your monthly energy usage and bills. It will also help make your system last longer. This is just as important as scheduling for your annual maintenance and repairs on your HVAC systems. Most HVAC systems have a filtration system and over time, your filter will get clogged or dirty. It’s important to make sure to replace your filter once a month (or as needed) to maintain your HVAC system and work efficiently. 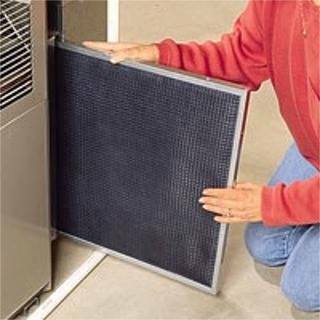 If you don’t replace your filter for a long period of time, this can damage the unit ending in either a costly repair or having to replace the unit. These are only a few tips we have to winterize your home. If you want to learn more on what other steps you can take to cut down on your energy or have any maintenance or repairs that need to be done, call us at 866-848-3300. Previous Article Previous Article: Should You Replace or Repair Your Ductwork?